Can You Use Polyurethane on a Wood Deck? A protective polyurethane topcoat is a great way to seal your wooden deck and increase its longevity. Even if you decide not to stain your deck, you should always apply some kind of sealer to keep it protected from the elements. Otherwise, you risk having your deck rot out within the first couple of years. 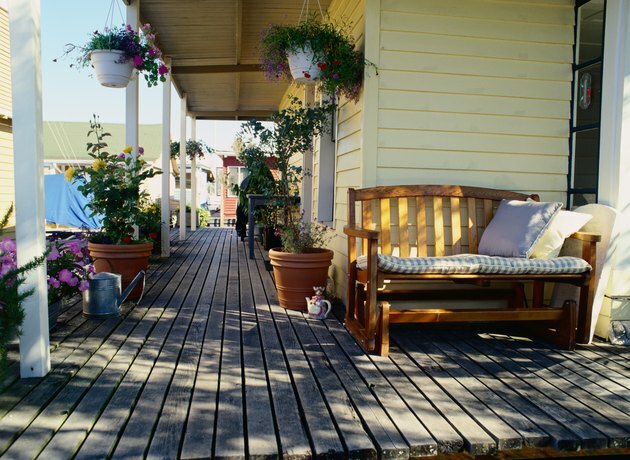 Keep wooden decks protected with polyurethane. Even if this is a brand new deck that you just built, you should give it a thorough cleaning before you do anything with it. If you notice any oil stains on it, these can be lifted with mineral spirits. If a pet or other animal has made a mess on it, this sort of stain can be lifted by pouring hydrogen peroxide directly on it and then coating it with plastic wrap overnight. Believe it or not, you don't have to stain a deck or any other wood surface before applying a protective topcoat, such as polyurethane. If you prefer the fully natural look of the wood without a stain to enhance it, you can go ahead and paint the polyurethane on right away. If you do want to stain, paint it on with a brush or roller and allow it to dry. As long as it's not raining or humid, the deck should dry pretty quickly. There are a lot of types of polyurethane, oil-based, water-based and oil-modified, clear and pigmented. All you really need to look for is an exterior polyurethane, which will be right on the label. Most exterior types are typically oil-based, which is ideal because it stands up to rainy weather better than a water-based interior polyurethane would. Stained or unstained, it's time to get that protective polyurethane on your wood deck. As for actual application, you can brush it, roll it or spray it, whichever you feel most comfortable doing. When that first coat dries, it's normal for it to bubble up a bit. Don't panic -- just lightly sand the surface until the bubbles disappear and sweep up the dust. Stained wood surfaces generally require two coats of polyurethane while unstained surfaces require at least three. What Kind of Varnish Goes Over Painted Wood?